The Dashboard is the first main screen of Weather Station. Its main purpose is to show you the current operating status of the plugin and to highlight commonly used links, items and analytics. Dashboard: its use is described below in this page. Stations: offers you a way to manage stations and get shortcodes. Events: displays the Weather Station events log. Settings: to connect to services, adjust the mode of operation and set parameters. Screen Options: to adjust the items shown on the current screen. Help: to obtain inline or online help regarding the current screen. The first element in the dashboard is the welcome panel. This panel highlights the most important (and most used) features of Weather Station. You will find in this panel a button allows you to configure connection to services, a shortcut to add a station and links to the stations management screen, to the settings screen and the events log. A last link gives you direct access to the Getting Started page of this handbook. If you do not want this panel to appear in the dashboard, just click on the “dismiss” cross at the top right of the panel. To show this panel when it is hidden, go to the “Screen Options” tab. 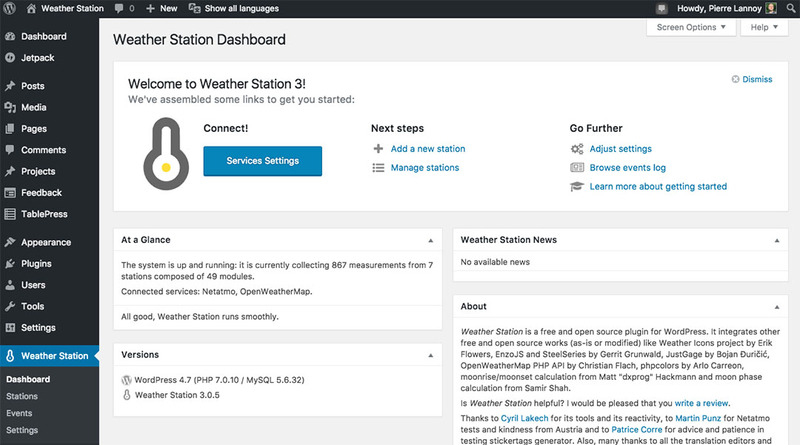 This box, which is replicated in the main WordPress Dashboard, allows to identify “at a glance” the operating status of Weather Station and the main elements of its status and its connectivity. This box displays important notifications generated by Weather Station. It can be informations about background processes (like applying fixes, importing historical measurements, etc.) or warning about security, versions or database. This box provides you with a summary of cache performance for the last 24 hours, for each item for which this cache is enabled. The first indicator, called “efficiency”, shows the Cache Hit Ratio as a percentage, while the second indicator shows, in milliseconds, the time saved per query by using the cache. This box describes the main versions of your WordPress and Weather Station installation. It also contains a link to the plugin’s internal changelog and a summary of your server configuration. You can find a full public changelog here. This box displays a news feed coming from the blog section of this site. It shows you plugin announcements and meteorology related articles. The Weather Station Dashboard displays some other boxes – like “about”, “licenses” – and may displays many new boxes in the future versions of the plugin. Screen Options: use the “Screen Options” tab to choose which Weather Station Dashboard boxes to show. Drag and Drop: to rearrange the boxes, drag and drop by clicking on the title bar of the selected box and releasing when you see a gray dotted-line rectangle appear in the location you want to place the box. Box Controls: click the title bar of the box to expand or collapse it.